This year’s Fort Lauderdale boat show featuring $3 billion worth of boats and gear, set on more than 3 million square feet of space will play host to some incredible feats of super yacht design. Ready to explore the higher latitudes of Earth is Moran Yachts’ 247-foot exploration vessel Northern Star. Capable of a range of 8,500 nautical miles and classed for light sea ice she is finely tuned and kitted out for long cruises to the far reaches of the world. Fitted with three generators, four stabilizer fins, two side-thrusters, and three tenders Northern Star is very well prepared. 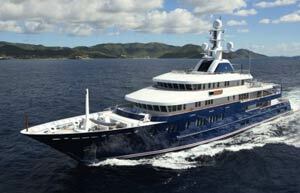 She has six decks accommodating 12 guests and 22 crew. All the guest cabins are placed on the main deck with large windows, while the owners’ suite on the upper deck has virtually horizon-to-horizon views. The largest yacht built in the US since the 1930s will be making its debut at the show. At 281 feet and 2,950 tons, Cakewalk is claimed to be the biggest yacht ever built in the United States in terms of volume. The Perini Navi 201-foot Felicita West is the largest and fastest aluminum sailing yacht in the world. The flybridge is so big that all twelve guests can comfortably sit in the sun surrounded by the gleaming mast machinery. A large swimming platform descends from the main deck with easy access into the water or onto jet tenders. You can also find spectacular views from a crow’s nest lift that ascends 131 feet. The 2010 Fort Lauderdale International Boat Show runs from October 28 to November 1 in Florida, USA.